Brace yourself: More celebs are coming to HSN. We were watching early Wednesday morning and saw a promo saying that NASCAR driver Danica Patrick is debuting a line of athleisure apparel, called Warrior, to the No. 2 home shopping channel. The collection premieres Jan. 4. And on Tuesday, HSN put out a press release announcing that Kim Kimble, a Hollywood celebrity hairdresser, is launching a product line on Thursday and Friday. “I’m a true believer that ‘Style and Healthy Hair Should Co-Exist,’ so that is why I created the product line,” she said in a canned statement. “Kim will first introduce her new Silk product line, featuring a trio of intense moisturizing products infused with an herbal melange and botanical oils that penetrate deep into the hair cuticles and scalp to revive dry, frazzled hair,” according to the press release. Kimble will return to HSN this spring to share products from her Bounce Back Curl Collection, which include items for curly hair. The fifth season of “LA Hair” bows Jan. 5. Well, at least someone got engaged this Christmas. Jewelry Television host Nikki Coggins apparently got a ring from from her handsome honey, Chuck Devotie. Coggins posted her good holiday news on Facebook, including a photos of Devotie on bended knee proposing on Christmas Eve. Her beau is a sergeant on the New Market Police Department in Tennessee. They both look extraordinarily happy, so congrats to all. Jersey boy QVC vendor Dennis Basso did not have a Merry Christmas: Thieves stole millions of dollars worth of sable coats from his chi-chi Madison Avenue salon. The gravel-voiced furrier was the victim of discerning robbers who broke into his shop at 5 a.m. Christmas Eve, an action that was recorded on video security cameras. The crooks struck while Basso was celebrating the holidays in Aspen, Colorado — far from his roots in Morris County, where we also grew up. The robbers only took the shop’s most pricey coats, the sables, which in some cases were worth $200,000 each. Of course, Basso’s QVC wares are faux, not real, fur. Celebrity stylist Michael O’Connor, who spent years on QVC presenting its Affinity Diamond line, has designed a collection for Jewelry Television. But it ain’t diamonds. We hope to speak to O’Connor next week about why he decided to do faux diamond pieces for JTV’s Bella Luce collection, a collaboration that the shopping network announced on Wednesday. The jewelry will debut Jan. 3 at 6:00 p.m.
Charming O’Connor has more than three decades of experience in the jewelry and fashion industry, and is a celebrity stylist and fashion commentator. JTV’s exclusive Michael O’Connor for Bella Luce collection delivers elegance and style day or night. O’Connor creates stunning jewelry with the look, feel and quality of luxurious red-carpet designs. Each piece is crafted in sterling silver with Eterno accents and is stamped with O’Connor’s signature logo. Additionally, a pink Bella Luce jewel is tucked within the interior of many of his designs. When we worked for a trade publication that covered the cable TV industry, for several years every January we attended the Consumer Electronics Show in Las Vegas. We dreaded it. You need a Segway to traverse the huge convention center in Vegas, the press room was stuffed to the gills with ink-stained wretches, and your hotel was usually a million miles away from the action, in a town where 200,000 attendees are all trying to catch cabs. So we read with glee on Monday HSN’s press release about it hosting an event t the show, which we no longer attend. The No. 2 home shopping network said it was “tapping into the incredible network of entrepreneurs that attend CES in Las Vegas each year,” partnering with Flex, “the Sketch-to-Scale solutions provider that designs and builds intelligent products for a connected world,” to host a search allowing entrepreneurs to present their products and develop a manufacturing partnership with Flex. Building on its existing American Dreams initiative, HSN is organizing a judging session to identify new consumer products that surface every year at CES, for subsequent introduction to HSN’s national audience. “With HSN’s American Dreams, we have built an incredibly successful platform for entrepreneurs to launch their products, while telling their stories and connecting with customers directly across our TV, digital and mobile channels,” HSN President Bill Brand said in a canned statement. The panel will review the entrepreneurs from scores of entries submitted in the weeks leading up to CES 2017. Each entrepreneur will have five minutes to showcase his or her products during a two-hour block before a panel of retail, design, manufacturing and consumer technology executives. In addition to Brand, the judging panel will include: Randi Zuckerberg, Angel Investor, author and host of Dot Complicated on SiriusXM; Mike Dennison, president, Consumer Technologies Group, Flex; Steven Heintz, vice president of design and engineering, Flex; Ryan Ross, HSN’s executive vice resident of marketing and digital commerce; Adam Freeman, host of HSN’s “The Monday Night Show with Adam Freeman; Dara Trujillo, HSN’s vice president of new business merchandising and development; and several other HSN execs. CES 2017 exhibitors and the public are invited to present their product to the judges Jan. 6. Entrepreneurs interested in presenting their product can email AmericanDreams@hsn.com to pre-register. The event will take place from 6 p.m. to 8 p.m. at The Venetian Hotel, Bellini 2006 Ballroom, 3355 S Las Vegas Blvd., Las Vegas. We’re running on empty, exhausted after arriving in NJ at 6:30 a.m. Sunday on a red-eye flight from Phoenix. We didn’t sleep much on the plane, sandwiched in a middle seat, and we didn’t take a nap today, since we were running around trying to catch up on Christmas stuff. But we felt compelled to blog about the shocking death of ex-Evine host Connie Kunkle. We were on vacation when we read abut her demise, at the young age of 58, on Facebook. We didn’t have a laptop to write about it when it happened, but it truly disturbed it and caused us sorrow, in a haunting way. We were even more stunned to read that Kunkle had died of a special kind of dementia. How could that be? She was so young. Her friend Andy Taylor posted the news last week. Friends of Connie: It is with deep sorrow that I share that our friend Connie Kunkle has passed away at age 58. Little more than a year ago, Connie was diagnosed with frontotemporal dementia, at which time she moved to Texas to be with her sister, Judy. In the last few months, Connie transitioned to a memory care facility where she received loving care. I hope it brings some comfort that Connie never ceased to be her wonderful self, with the sparkling green eyes, and delighted her caregivers despite her advancing condition. She passed peacefully in her sleep last night. My 36 yr. friendship with Connie began with Disney Entertainment in Florida, after which she starred on Broadway and touring companies, sang around the world and in recent years was a very popular and dynamic on-air host for ShopNBC (now Evine). Arrangements will be forthcoming. I know we all share in this shock and grief and are heartbroken. Please share this news with anyone who would want to know. Most of all, please know that Connie is no longer bound to a broken body and mind, and is now with her heavenly father, probably belting out a show tune – that’s our Connie! The tributes poured in about the vivacious and gorgeous blonde host. We enjoyed her her on ShopNBC/Evine, and blogged about her “early retirement” exit from the network in March. At the time, Evine announced that Kunkle was leaving and gave no hint about her dementia diagnosis. We want to sincerely thank Connie for all the smiles and laughter she has brought to us and her viewers over the past 11 years. We wish her all the best as she starts this new phase in her life and will miss her dearly. Take a trip down memory lane and enjoy a few fun clips of Connie over the years plus share your favorite Connie memory in the comments below. We had her bio from Evinelive.com, but had no idea how deep her background was as a performer and singer. We’d venture to guess that most Americans have friends or family who have suffered from dementia, and we so wish that scientists would come up with a cure. It is complicated: We used to blog about TBI and dementia for our former college boyfriend. There are many kinds of dementia, with different causes, and dementia does not equal Alzheimer’s. But it does translate to heartache for those who get it — whatever kind — and their caregivers. 1. Chaz Dean’s Wen Hair Care and Guthy-Renker agree to pay a $26.25 million settlement over a class action suit that alleged the product was making customers’ hair fall out and putting scabs on their scalps. 2. QVC notified people who bought Wen from the network that they were entitled to seek part of that settlement money. 3. QVC offers a package of Wen products as its Friday Today’s Special. QVC must be doing a hell of a business with Wen if it risks selling it despite all the complaints about it — and the settlement. Stop the presses: On Thursday announced that it had appointed Todd Sprinkle as its chief information officer. We think that was a promotion. Sprinkle will oversee QVC’s global IT organization spanning the United States, the United KingdomK, Germany, Japan, Italy, France, China and at QVC’s global business service operation in Poland. 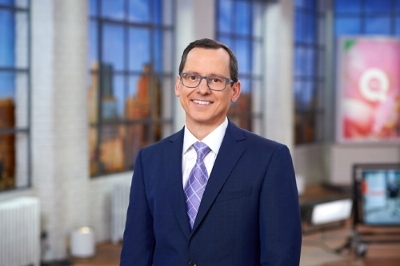 “Under his leadership, the QVC IT organization will continue to raise the bar in delivering a seamless and engaging multiplatform experience for customers and team members around the world,” the press release says. Sprinkle reports to QVC CEO Mike George. “QVC combines the best of retail, media and social to create the world’s most engaging shopping experience,” George said in a canned statement. Sprinkle held various roles at QVC since joining in 2007. Key advancements under his leadership include the development of the QVC for iPad App and QVC’s responsive design implementation. In addition, he has led the development QVC’s global content management strategy and key initiatives in IT strategy, planning and effectiveness. Prior to QVC, Sprinkle spent 12 years in senior-level roles at Turner Broadcasting. He began in IT, then transitioned to become Vice president, network operations, with responsibility for broadcast operations, media operations, media management and the project management office. Prior to Turner Broadcasting, he was with Macy’s, where he worked in IT Application Development. How the hell did this story get by us: Chaz Dean’s Wen Hair Care and marketer Guthy-Renker have reached a $26.25 million settlement of a class action suit brought by consumers who alleged the product made them lose hair. People magazine, of all places, on Nov. 7 wrote about the proposed settlement of the lawsuit filed against QVC vendor Dean. At that time, the publication said that a South Cali federal judge would have to approve the deal. Apparently the judge did OK it, because QVC customers who bought Wen from the home shopping network have received emails about the multi-million dollar settlement. There are two tiers of those eligible for greenbacks: Some will get $25 and others — who alleged severe damage to their hair and scalps — are entitled to up to $20,000. Despite the settlement, Wen says it did no wrong. This summer the Food and Drug Administration announced that it was launching an investigation of Wen after receiving 127 consumer complaints against the product. We’re heading toward the end of the year, when people’s contracts with their employers may or may not be renewed, or folks decide on their own they want to fly the coop. And so QVC host Albany Irvin announced Friday on Facebook that she is leaving the No. 1 home shopping channel. “Hi friends, today I wanted to share the news with you that I have decided to leave QVC to spend more time with my family,” she posted. We checked, and her name is already off QVC’s website. You are currently browsing the Homeshoppingista's Blog By Linda Moss blog archives for December, 2016.